The UK's most actively purchased magazines and digital editions have been revealed for the first half of 2016. According to latest figures from the Audit Bureau of Circulatons, TV guides dominate the top three most actively purchased magazines in the UK, with all of them – Bauer-owned TV Choice, Time Inc's What's on TV and Immediate Media's Radio Times – falling year on year. The independently-published Slimming World magazine grew 14.2% year on year, having announced last year that it had doubled its circulation over the previous eight years. 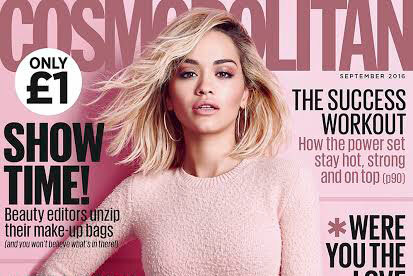 Hearst-owned Cosmopolitan was the biggest gainer in the top 100, reporting a 59.9% increase year on year in total circulation after it slashed its cover price to £1 and decided to start distributing 100,000 free copies to shopping centres, cinemas and airport departure gates. Anna Jones, the chief executive of Hearst, said: "It is extremely encouraging to see that our dynamic new routes to market are working. Cosmopolitan was the first brand to lead this strategy last year, and the brand continues to grow." Meanwhile Reader's Digest was the biggest fallers in the Top 100, down 32.1% to 104,057 each month.